When Sir Alex Ferguson retired at the end of the 2013 season, he was the most successful football manager Britain had ever seen, having won twice as many trophies as his nearest rival. But that success had not come easily. Thirty-five years previously he had arrived at the rain-swept training ground at Aberdeen F.C. as the recently sacked manager of St Mirren; a hothead with a troublesome reputation and a lot to prove. Not for nothing, many thought he was a risky choice. Fergie Rises returns to a time when Ferguson was lucky to get Aberdeen, not the other way around. It's the story of an eight-year revolution that saw the Dons and their ambitious young manager knock the Old Firm off their perch, taste victory in Europe for the first time, and electrify Scottish football. 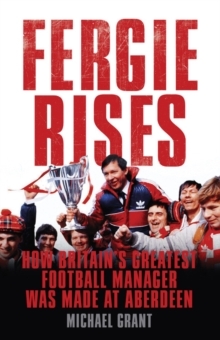 When Ferguson finally left the club for Manchester United, in 1986, fans and rivals were unanimous in believing he had engineered one of the most astonishing upheavals in the game's history. Taking a view from inside the dug-out, and with the guidance of the giants of that Aberdeen team - including Willie Miller, Jim Leighton and Gordon Strachan - Michael Grant lays bare the full story of this remarkable but little known period of Ferguson's career, revealing it as the crucible in which Britain's greatest football manager was forged. Along the way he examines the personal tragedies Ferguson overcame - the deaths of his father and his mentor Jock Stein - and the rivalries, setbacks and triumphs that shaped a sporting genius.